Last time I posted a link to many Lean and Agile games at www.agilitrix.com. One of the games that intrigued me was the Penny Game, a Lean Value Simulation that looks at the benefit of using smaller batch sizes, as well as identifying what has value to the customer. There is a great post at scrum-breakfast.com that describes a version of the game and an iteration of it. Because of the simplicity and length of the game, I think it's perfect to use as a Lean training aid, to teach the benefits of flow and other basic Lean principles. The basic premise is that a group of 4 workers passes along coins to each other in batches. Each worker adds value by turning the coins over. Simple, but effective. By reducing the batch size, the flow improves and the customer receives the coins faster. The game is played in 4 or 5 rounds, and a stopwatch is used to time how long for the first coin to reach the customer. In the first round, a batch size of 20 is used. Each person has to turn over twenty coins, before passing all of them over to the next worker. As well, a manager times each worker with a stopwatch to determine how long it takes them. A little extra twist is added by forcing the workers to use their left hands. In the second round the batch size is reduced to 5 coins and the improvement is readily apparent. The customer receives the coins faster. This change alone is sufficient to demonstrate the benefit of small batch sizes and why striving for one-piece flow is efficient. In subsequent rounds, more improvements are added. Using both hands, instead of just the left, illustrates a kaizen on the process, a more efficient method. Then choosing only the high value coins, shows the importance of focusing on the value-added work. Although, in manufacturing, if the customer wants high and low value coins, you gotta make both. I can see in software development, it might be more difficult to identify what the customer wants. 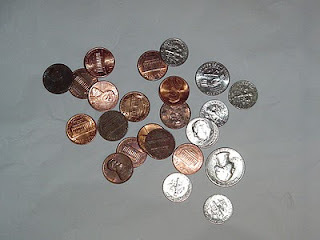 Another minor variation to the Penny Game can be found at http://scrumcoaching.wordpress.com where the facilitator changes the stop watch tracking to determine how many coins can be moved in a certain amount of time. Both sites contain reports of the sessions and the discussion points that followed each round. Great descriptions of the games worth reading. Since I come from a manufacturing background, I have one variation I am interested in trying. Instead of the customer starting the round with the whole batch of coins, have a list of different types of coins (the order) that the customer wants. The workers have to flip coins in batches of the same type (to simulate a single die) to try to get all the different types to the customer on time. Of course, the customer may change their mind (naturally) and the orders will change. It would be a great exercise in analyzing the batch sizes and determining how much buffer to hold between each worker. If I do try this, I will repost to let you know how it goes! Update: See this new post for more variations on the Penny Game. 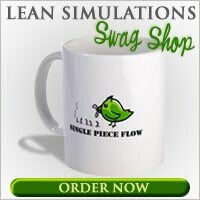 See many more games and simulations in my list of Lean Games! For a great introduction on flow and how to reduce your lead time, check out the book, "Creating Continuous Flow," by Mike Rother. I have created a modified form of the game, described here: http://kc.agilehood.org/?p=450. Feedback appreciated! Just IRA-approved silver and gold coins can be a part of the precious metal Individual retirement account. Whenever you ponder such as these coins, it is important to know about the actual cash that are appropriate, http://www.silver-eagle.us. Thanks for sharing such article.